What’s at stake at #COP19 talks in Warsaw? 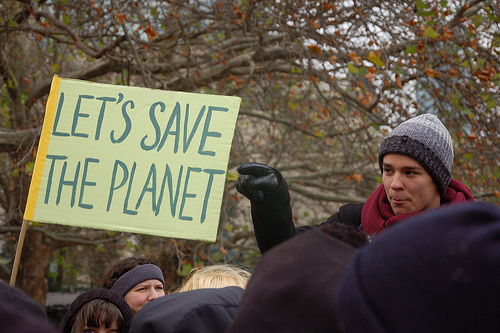 What can the world expect from the next round of global climate talks in Warsaw in November? And will governments put money behind their climate pledges? Journalists from around the world had the chance to quiz Achim Steiner, head of the UNEP, in an online video conference organized by DW Akademie. Web session with Achim Steiner (UNEP) from DW Akademie on Vimeo. Do you really need all of that? All we need is less?! from youthinkgreen on Vimeo. Flo is more than a funny guy in a video. He's a musician with a message: Think about your daily routines, your daily needs, your energy consumption or the way you use cars and plastic bags. Journalists from all over the world come to Warsaw to report on what is happening at the 19th climate conference. In a short interview four of them describe their impressions. What are the most pressing climate issues in your home country? Are those issues addressed at all in this conference? Giuliana Miranda, Brazil: The intensification of the extreme weather events is a hot topic in Brazil. A quick stop-over in the German capital is always worth it. Many participants of this year's UN climate summit in neighbouring Poland are likely to do just that with the Dahrendorf Symposium taking place in Berlin on Thursday and Friday coinciding with the first week of the UN talks in Warsaw.